"Walking into a bookshop is like entering Aladdin's Cave. No, it is better than that. Thoughts, words, ideas, truths are almost tangible. I go in with a very good idea of what I want, but am very soon seduced by other books. Where to start, what to choose? Sometimes it takes my breath away. You see, we live so far from town, an opportunity like this must be seized and savored, yet I must choose before closing time." NetGalley has acquired Bookish.com, the consumer-facing book recommendation and retail website that was launched in 2013 by Hachette Book Group, Penguin Group and Simon & Schuster and sold to Zola Books in 2014. Zola is retaining Bookish Recommends, the book recommendation engine that has been renamed Zola Recommends. As a sister company to NetGalley, Bookish will be "an editorially independent, standalone site with its continued commitment to connecting visitors with interesting and relevant content." NetGalley and Bookish.com will continue to expand their respective communities, while "exploring natural ways to connect the editorial content between the two websites to best serve readers, publishers, and authors." "We are very excited to bring Bookish's consumer-facing, curated, editorial voice to the NetGalley family," said Fran Toolan, CEO of NetGalley and Firebrand Technologies. "We view Bookish.com as yet another way that our client publishers can help their books succeed." Zola Books CEO Joe Regal said, "I'm proud of how the Zola Books team built Bookish.com into the vibrant and exciting experience it is today. As Zola intensifies its focus on creating superlative book technology services, we are delighted that Bookish.com will have an opportunity to fulfill its mission under NetGalley's stewardship." 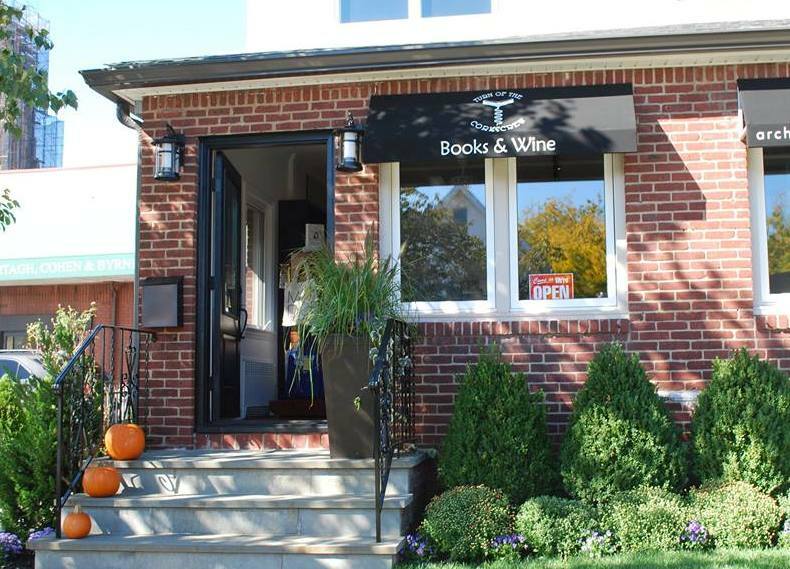 Founded a year ago by Peggy Zieran and Carol Hoenig, Turn of the Corkscrew, Books and Wine, Rockville Centre, N.Y., is seeking help. Ongoing street construction that began in May has "turned the tide for us in a negative way" after a strong start and a "warm welcome," they said. In their GoFundMe campaign, which in five days has raised $5,000 toward a goal of $75,000, the owners continued, "Customers told us they couldn't get to us due to the mess our street was in. Attendance at our events dropped off considerably due to street closure and lack of parking. For one week we had no sidewalk and potential customers hesitated to walk across the plank to get to our store! Our business plan did not account for this major interruption in business, which is why we are asking for your help... because we need your help! If we don't get some funding, our doors will have to be closed and the community will lose an independent bookstore that is a great place to gather, and where we host many programs, including author discussions, workshops, and the very successful Creative Writers Camp which we hosted this summer for 18 young talented writers." Zieran and Hoenig noted that they "put our homes on the line and invested $100,000 of our own money to secure a loan for a startup. We did this because we believe in this venture and not because we expected to get rich. However, we never foresaw something as unexpected as street construction to hinder our progress towards success." The GoFundMe money will go to ordering books for the "many events scheduled in the coming months... as well as books and other merchandise for the holiday season, while a sizeable monthly loan payment looms over us." After almost 15 years, Unshelved, the daily online comic strip set in a library, is winding down. As of November 11, Gene Ambaum and Bill Barnes will stop making new Unshelved comic strips and will publish "classic" strips. In an announcement about the change, they remembered: "When we published our first strip on February 16, 2002, the iPhone was just a glint in Steve Jobs' eye, Facebook was years away from reuniting anyone with their high school sweetheart, and tweeting was still exclusively for the birds." They called their experience "a madcap journey. After a few years we had enough readers that we both decided to gamble by quitting our day jobs to try doing this cartooning thing full-time. It was harder work than we expected. There were many years when we were on the road, away from our families, for weeks at a time, giving talks and selling our books and merchandise at library conferences and comic conventions." Besides 4,500 strips, the pair created Pimp My Bookcart, merit badges for librarians, a thumb drive in the shape of a card catalogue, many T-shirt designs, the library notebook, the library raid jacket and full-length comic adventures about BEA, an evil bookmobile and a blackout. In April, Barnes left to take a break from cartooning, but he'll return to draw and co-author the last week of strips. For his part, Ambaum is "cooking up both a new webcomic and a new book review site we think you'll like, and he'll let you know when they're ready for prime time." 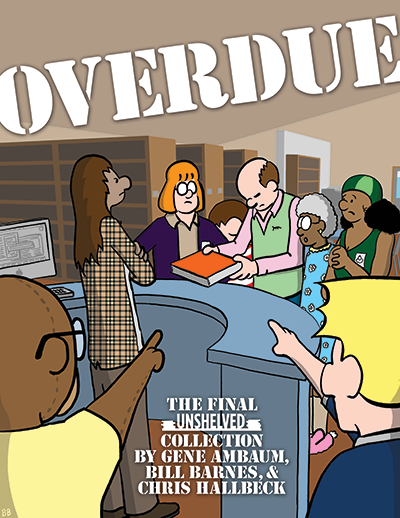 In a kind of a celebration, Unshelved is coming out with its largest collection ever, called Overdue (the original name of the strip), with more than two years of strips. It's available here. The 2,000 bookstores celebrating the U.K. and Ireland's first Bookshop Day last Saturday had "higher footfall and sales," the Bookseller reported. Sponsored by the Booksellers Association and intended to coincide with the annual Books Are My Bag celebrations, the Day included appearances by "high profile authors, illustrators in residence and customers reading in bookshop windows." 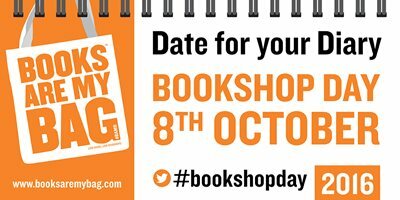 Customers were encouraged to tweet their support for bookshops using the hashtag #BookshopDay. Bookseller Kate Harris of Harris & Harris Books in Suffolk told the magazine, "I have a teeny tiny bookshop but it was crammed full today with lots of delish readers and shoppers. Being such a small shop, it's tricky to have in-house events, but I had a colouring competition hand out, gift wrapping, lots of giveaways, including the amazing BAMB bags and bookmarks. I also had a basket of autumn goodies (the only orange fruit I could find was a bag of satsumas, so I filled up with apples from our meadow and some smashing conkers I found on my walk) to hand out rather than the usual tin of chocolates.... Everyone loved it and my home made sloe gin too. Lots of happy people... suffice to say a grand day was had by all." Author Ann Cleeves, who attended a "Shetland Afternoon Tea" event at Far from the Madding Crowd bookshop in Linlithgow, Scotland, told the Bookseller: "We must celebrate our bookshops--they have been vital during my thirty-year career. After all, nothing beats an expert book recommendation. Like libraries, bookshops have the power to open doors to other worlds. We must cherish them--everyday." Beginning next week, Macmillan Children's Publishing Group's crowdsourced imprint Swoon Reads from Feiwel & Friends will expand from featuring only teen romance titles to titles in all YA genres. Swoon Reads invites writers to submit manuscripts to its website, where site members can read, rate and critique others' manuscripts--and receive writing and revising tips from Swoon Reads staff. Once a manuscript is acquired, the community votes on the title's cover and communicates with the author through blog posts. So far, some 50 titles have been acquired and another 10 are set to be acquired by the end of the year. 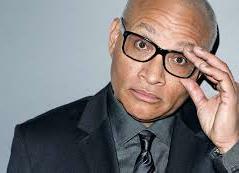 Larry Wilmore, comedian, writer and former host of The Nightly Show, will host the 67th National Book Awards ceremony and benefit dinner on November 16 at Cipriani Wall Street in New York City. National Book Foundation chairman David Steinberger said that Wilmore's "skillful use of comedy, whether as a television comedy writer or a published author is entertaining and transformative, and we want people to find that books are just as exciting." National Book Foundation executive director Lisa Lucas added: "Larry Wilmore, who is hilarious, intellectual and well-loved by so many, is the perfect choice to host the awards, remind us of the cultural value of books and writers, and to welcome in new audiences." 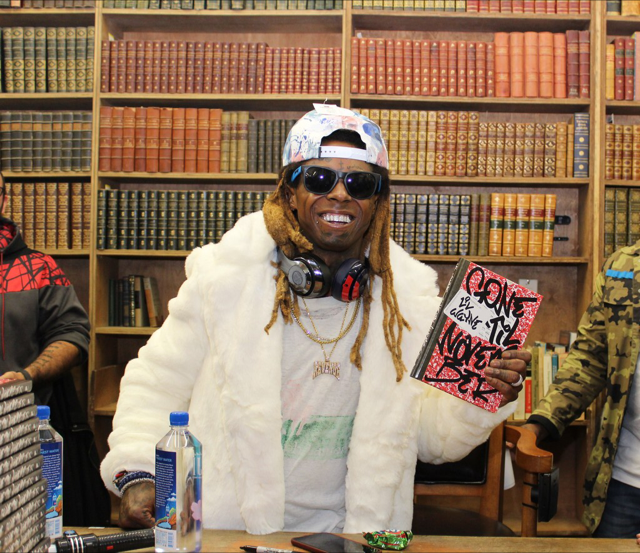 Grammy-winning artist Lil Wayne visited Strand Books in New York City to sign his first book, Gone 'Til November: A Journal of Rikers Island (Plume). 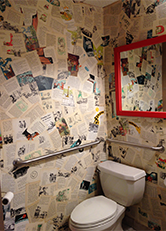 The Novel Neighbor, St. Louis, Mo., is among the 10 finalists chosen for the America's Best Restroom Contest, sponsored by Cintas, a company that designs and implements full service restroom programs for businesses. Voting ends November 2, and the winner will be announced later this fall. Kelly Rudolph has been promoted to senior director of publicity. She joined the company in 2014 and earlier worked in publicity at Putnam and Amy Einhorn Books. Anwesha Basu has been promoted to associate director. She joined the department in 2014. Bunny Slopes by Claudia Rueda (Chronicle Books). I Don't Want to Be Big by Dev Petty, illustrated by Mike Boldt (Doubleday Books for Young Readers). Fresh Air: John Hudak, author of Marijuana: A Short History (Brookings Institution Press, $14.95, 9780815729068). Diane Rehm: Rep. John Lewis, co-author of March: Book Three (Top Shelf Productions, $19.99, 9781603094023). The View: Neil deGrasse Tyson, co-author of Welcome to the Universe: An Astrophysical Tour (Princeton University Press, $39.95, 9780691157245). Conan repeat: Tavis Smiley, co-author of Before You Judge Me: The Triumph and Tragedy of Michael Jackson's Last Days (Little, Brown, $27, 9780316259095). Late Show with Stephen Colbert repeat: Bruce Springsteen, author of Born to Run (Simon & Schuster, $32.50, 9781501141515). The Handmaiden, directed by Park Chan-wook and based on the novel Fingersmith by Sarah Waters, will be released October 21. You can watch the trailer here. Clint Eastwood is in talks to direct a film adaptation of Impossible Odds by Jessica Buchanan, Erik Landemalm and Anthony Flacco, according to the Hollywood Reporter, which noted that Warner Bros., Eastwood's longtime home studio, optioned the memoir. The Sympathizer by Viet Thanh Nguyen (Grove/Atlantic) and Nagasaki: Life After Nuclear War by Susan Southard (Penguin Books) are winners of the 2016 Dayton Literary Peace Prize for fiction and nonfiction, respectively. The runners-up are, for fiction, Delicious Foods by James Hannaham (Little, Brown), and for nonfiction, Find Me Unafraid: Love, Loss, and Hope in an African Slum by Kennedy Odede and Jessica Posner Odede (Ecco). Sharon Rab, founder and co-chair of the Dayton Literary Peace Prize Foundation, said, "This year's winners remind us that the effects of war reverberate many years and often many generations after treaties are signed. Together, these stories by Viet Thanh Nguyen and Susan Southard offer cautionary tales but also guideposts to lead us toward a greater understanding of those who are originally seen as enemies." The winners will be honored at a gala ceremony in Dayton, Ohio, on November 20. 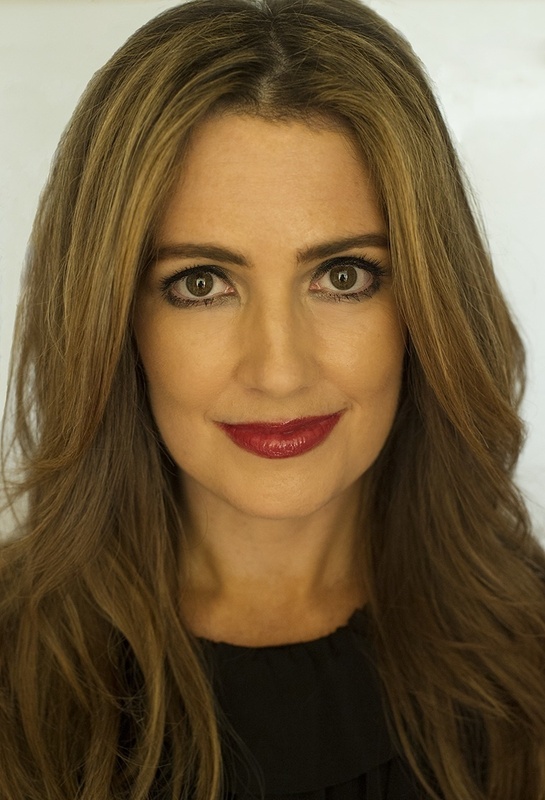 Jennifer Niven is the author of the bestselling All the Bright Places. 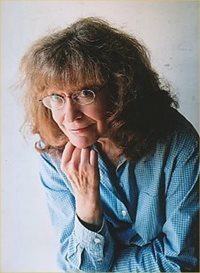 She has also written the screenplay for the movie version of All the Bright Places, four novels for adults and three nonfiction books. She is the founder of Germ, an online literary and lifestyle magazine for readers high school age and beyond. Niven grew up in Indiana and now lives in Los Angeles. 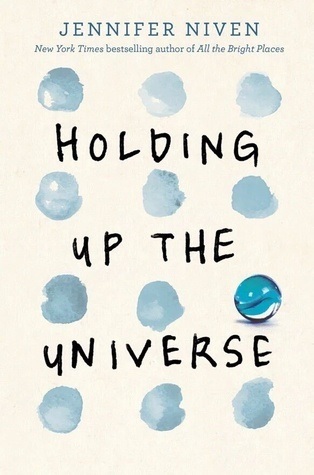 Holding Up the Universe, her YA novel about "seeing and being seen," was released by Knopf on October 4, 2016. The most recent copy of the New Yorker and these books: How I Live Now by Meg Rosoff, Arcadia by Lauren Groff, History Is All You Left Me by Adam Silvera, and Shirley Jackson's Let Me Tell You: New Stories, Essays, and Other Writings. Water for Elephants by Sara Gruen. (I want to read it, but I know I can't--I'm unable to read anything sad about animals!) And I may have fibbed about reading War and Peace. We Have Always Lived in the Castle by Shirley Jackson, which features the most complex, mesmerizing narrator I've ever read. Girl Waits with Gun by Amy Stewart, which--happily--I loved. Speak by Laurie Halse Anderson, and everything by Judy Blume. Reading her, I knew I wanted to grow up and write honest books that would both help and entertain. "...[i]nsist on your cup of stars." That will not be still"
E. Lockhart's We Were Liars. One of my favorite YA books ever. It really knocked me off my chair. Mr. Rochester from Charlotte Brontë's Jane Eyre. And Simon from Becky Albertalli's Simon vs. the Homo Sapiens Agenda. 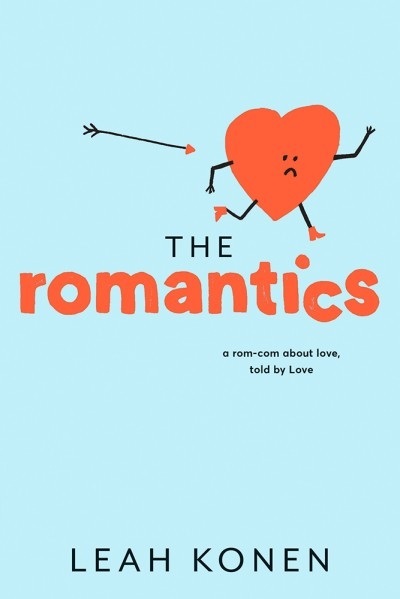 This charming novel, narrated by Love herself ("[f]requently referenced, usually misunderstood"), is both a love story and a romantic comedy. Ironically, that's the genre most hated by movie buff and high school senior Gael Brennan, who is a huge fan of Alfred Hitchcock and Wes Anderson films. So it figures that romantic comedy is a favorite of Sammy Sutton, the incredibly annoying babysitter of Gael's little sister, Piper. According to Love, Gael is a Romantic, someone "who ruthlessly believes in Love in its finest form." Unfortunately, Gael's beautiful new girlfriend, Anika, does not. She's an Adventurer, defined as someone who "primarily seeks out a partner for life's adventures (and misadventures...)." Shortly after Gael professes his love to her, a very quick "one month to the day since they'd first kissed," Gael arrives at school early to discover Anika liplocked with his best friend, Mason. Heartbroken, Gael punches Mason, quits band and generally mopes around, watching movies and eating snack-sized Snickers bars until his birthday. That's when his mom, oblivious to "The Ultimate Betrayal," invites Anika and Mason to Gael's birthday dinner. Overcome, Gael flees the restaurant, only to be run down by cute, first-year college student Cara, on her bicycle. As Love informs her readers, this accident leads to that "dreaded enemy of True Love since the dawn of freaking time," the Rebound. Shelf Talker: This teen love story, wittily narrated by Love herself, follows a high school senior and bona fide Romantic through a series of amorous entanglements.